I believe the road in between the small towns will be upgraded to interstate standards, but bypasses will be built around the towns. The bypasses will be tolled, I believe. Well...they're not exactly building a new Interstate....just upgrading the existing highway with grade seperated crossovers and ramps to the ranch entrances, with bypasses where needed. Not nearly as expensive. I can agree with you on US 281, though...that sounds like more overkill to me. I still say, though, that signing US 77 as "I-69" violates the spirit of the original intended I-69 corridor, which was US 59 to Laredo. I'd prefer an extended I-37 for US 77 myself, and save I-69 for when the Laredo-Houston segments are upgraded. But, they've made their decision, I guess. Yeah...sorry for the slight off-topic posting. It is always tricky when things in one thread get brought up that fits better in another. It's part of the flow of discussion. You may want to raise it there also, but it's probably run its course here. This future I-69 (when fully completed through southern Arkansas and northern Louisiana) will greatly alleviate a lot of the heavy truck traffic that's clogging up I-30/I-40 (aside from the split speed limit that buffers car traffic as well). Even if Tennessee doesn't build up US51 (it's a pain right now), the easy alternative is I-55 north to I-155 to Dyersburg. At the very least, I believe that Tennessee will conduct a toll feasibility study for I-69. TDOT has released its 2013-15 3-Year Plan and an accompanying Regional Project Highlights sheet. It's true that MAP-21 could provide funding for I-69; however, since MAP-21 contains no federal earmarks for specific projects and no non-I-269 projects are included in the 2013-15 3-Year Plan, I doubt TDOT will suddenly change their priorities to include I-69 project(s). I doubt TDOT will suddenly change their priorities to include I-69 project(s). the state is not moving ahead with any funding of the Tennessee portion of the Interstate 69 project until or unless there is a dedicated source of funding. The $140 million the state has spent on the north-south interstate so far has been federal highway fund money. Would a study demonstrate the feasibility of tolls for I-69? Phase 1 construction of Section 4 is “nearing completion,” according to Erwin White with the state Department of Transportation. Phase 2 construction for that section has not been budgeted. That phase involves the completion of the interstate base, asphalt paving, installing guardrails, installing signs and striping the interstate .... However, until federal funding is allocated for the project, the interstate will remain covered with what [Michael Harrison of Ford Construction] called “incidental asphalt.” The final layer of gravel and asphalt paving will have to wait until funding is approved and contracts are signed for the work. TDOT recently posted the Schedule for Commissioner Schroer's upcoming Region 4 bus tour and it is notable that, even though Obion County's first I-69 project is either complete or nearly complete, Commissioner Schroer did not include a visit to it on the bus tour. I guess it would be a pointless visit since it will probably sit unused for a long time. You may shake your head, but an endangered bat could force a new route for the proposed Interstate 69 through a portion of West Tennessee ... It's called the Indiana Bat ... This miniature mammal could determine where Interstate 69 travels from Millington to Dyersburg. The Indiana bat study has added some to time to the completion of the FEIS. The study was completed in August and no Indiana Bats were found. The consultant is working hard to have the FEIS submitted to TDOT for review by year end. We anticipate having a ROD around the 3 quarter of 2013. We have nearly spent all of the federal earmark dollars for I-69 and there are no further federal dollars dedicated to the I-69 project at this time. Federal dollars will be used to fund 80% of the project and without a commitment at the federal level it is difficult for us to continue our efforts to develop the project. Therefore, we have made the decision to postpone any further design work on the various segments of I-69 until there is a dedicated funding source. When the funding issue is resolved, TDOT will be ready to resume work. I'm beginning to wonder if TDOT's decision to shut down I-69 will have an impact on Mississippi DOT's desire to complete the Tunica area to Mississippi River Bridge SIU 11 of Interstate 69? LaDOTD and AHTD are already moving at a glacial pace in Louisiana and Arkansas. Progress on the local section of Interstate 69 continues to be stalled by a lack of federal funding ... Work on one local section of the interstate is continuing, and is actually ahead of schedule, according to Michael Harrison of Ford Construction ... Ford Construction has the contract for Section 4 of I-69, which extends from just north of the Titan Tire plant around to just south of West Main Street .... Phase 1 construction of Section 4 is nearing completion, according to Erwin White with the state Department of Transportation. 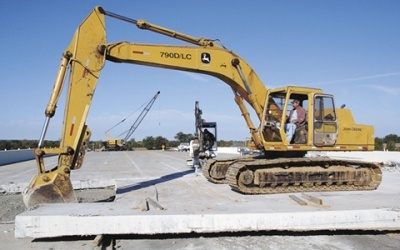 Phase 1 construction refers to grading, structures, roadway tie-ins that are necessary to maintain traffic around and across the project, erosion control, etc., he stated .... However, until federal funding is allocated for the project, the interstate will remain covered with what Harrison called incidental asphalt. The final layer of gravel and asphalt paving will have to wait until funding is approved and contracts are signed for the work. If they dont let any more sections ... itll stay closed, Harrison said. Work on the local leg of the interstate is winding down this fall, with no new federal funding allocated for the project locally. the west TN politicos ... were more interested in better routes from their region to Nashville than getting from Union City and Dyersburg to Memphis, hence the ridiculously overbuilt TN 22 freeway, US 412 from Jackson to Dyersburg, etc. The parts of US 51 freeway north of Dyersburg also fit in this mold. And now those politicians are gone, and the ones that replaced them aren't particularly interested in diverting resources to an area they think got disproportionate attention from the 60s through 80s, hence the lack of I-69 progress ... it'll be a while before the political pressure is there again. 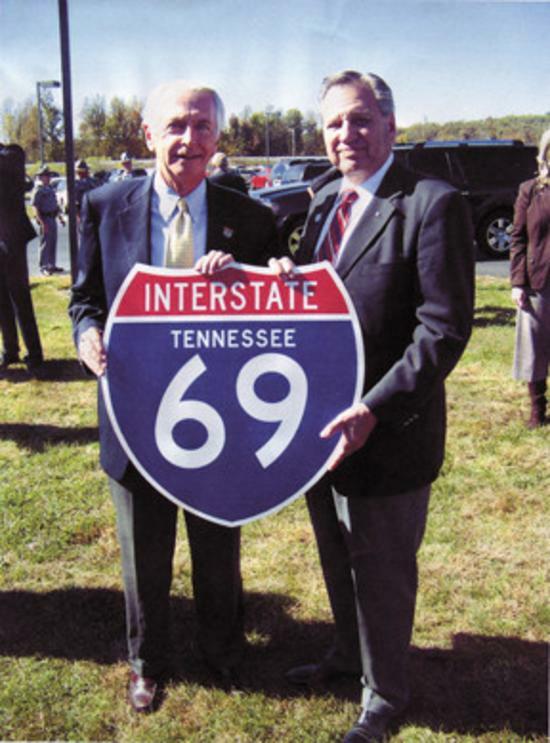 state Sen. Jim Kyle, D-Memphis and the Senate's Democratic minority leader., said I-69 is "certainly dead in Tennessee" at least for now, and he is critical of the process. "This is touted as a huge economic engine for every state touched by I-69," Kyle said. "For the commissioner to just do that I think is unusual.We've never had any public discussion of that decision with the legislature, particularly in the affected counties. They get a huge percentage of federal funding. "As near as I can tell, the justification he gave has never been explained to a legislative committee and I think it should be. I intend to ask the (Senate) Transportation Committee to hold hearings on the matter. It's another example that the focus of this administration is east of the Tennessee River. It's something especially we Shelby County and West Tennessee legislators need to ask." Tennessee has invested about $200 million in the I-69 corridor, which parallels the Mississippi River and U.S. 51, in planning, design and right-of-way acquisition. TDOT estimates it will take from $1.5 billion to $2 billion to build and complete the project through the state, according to Nichole Lawrence, TDOT's West Tennessee community relations officer. ... B.J. Doughty, TDOT's director of communications and community relations. "They (the federal government) have not said they are going to dedicate funding for it. What the commissioner wants is some dedicated funding for I-69, not only to Tennessee but to other states as well. We're ready to proceed when there is dedicated funding." The real root of the distrust here goes back to the botched 840 planning. The state spent tens of millions of dollars, maybe even hundreds of millions, that could have gone toward matching the federal share on other projects (I-69, TN 385, I-475, US 27, etc.) to avoid doing a federal EIS on 840 (and dug in their heels under West Tennessee governors like Sundquist and McWherter, I might add), and then the state dragged the construction out so long that the EIS and inevitable lawsuits really wouldn't have delayed its completion much. I think politically the winds aren't right at the moment, but eventually the Democrats will figure out again how to run statewide candidates in the south who can go back to the Whitten/Byrd days of "tax the rich yankees and spend it here in the south," or the southern GOP will figure out how to run on that platform again instead of the zealously-anti-(non-military)-pork one. That's the politics that built roads like I-68, I-22, and the original I-49, for better or for worse. But I wouldn't count on the rump Tennessee Democrats like Kyle to make that happen; Memphis is basically at the bottom of the state GOP's Christmas Card list, after decades of Democrats running roughshod at the state level, and it's gonna be a while before the GOP is done returning he favor. Schroer said the I-69 corridor in Tennessee has been in the planning stage for more than 20 years. He said the entire project will cost about $2 billion. Schroer said the northwest portion of I-69 will be completed within five to eight years, depending on state funding. He said additional parts of the interstate will require additional funding from a federal grant. Every other article/editorial that I have read on this subject indicates that I-69 construction in Tennessee is coming to a complete halt. Maybe finishing the I-155 to Kentucky state line Section of Independent Utility 7 ("SIU 7") to some degree is still "live"? Maybe finishing the I-155 to Kentucky state line Section of Independent Utility 7 ("SIU 7") to some degree is still "live"? Currently, there are no more congressional earmarks, no promises and no commitments on the federal level to help us finish this highway. That leaves TDOT staring at a $1.5 billion price tag to build 65 miles of new highway between Memphis and Dyersburg. It sounds to me like he is saying that work will continue on SIU 7 and that the above Jan 4 article reported the situation correctly. Completing SIU 7 would make sense in terms of connecting I-155 to I-69 in Kentucky and Indiana. Schroer has a legitimate point that it is hard to justify I-69 from Dyersburg to Shreveport without more committed funding. It will be interesting to see if any more Union City I-69 projects will get funding in the next year or so. The section from Dyersburg to South Fulton is all freeway except for South Union. Isn't the section under construction there designed to provide a full freeway bypass of South Union (which will then be a good candidate for the "Bypasses of Bypasses" thread)? Once that's done, the route will be a full limited access freeway all the way from I-55 in Missouri to the end of the Pennyrile Parkway in Henderson for northbound traffic. Southbound traffic will have to stop at the end of the ramp that carries US 51 off the Fulton/South Fulton bypass. I imagine the most expensive part of the Dyersburg to Fulton segment will be reworking the interchange with US 45E at South Fulton, KY.
Only thing I've ever noticed that is not up to Interstate standards, besides the interchange, is the U-turn required for northbound US 51/45W traffic to access Ken-Tenn Road, TN Secondary (mumble) and the obvious old routing of US 51/45W. A flyover northbound and some widening on the southbound ramp ought to knock out the problems at the state line interchange. Even with tolls allowed, the question would be whether there would be sufficient traffic volume along Tennessee's I-69 corridor to generate enough money from the tolls to account for a high percentage of construction costs. State Rep. Bill Sanderson addressed approximately 75 residents .... After Sanderson's detailed update on what is transpiring in Nashville he fielded questions from the audience, and Dyersburg Alderman Bob Kirk .... asked if there was a possibility of installing a toll road to generate revenue for the corridor. Sanderson responded that Schroer previously had addressed the use of toll roads to fund I-69. However, traffic studies indicated that there would not be enough traffic to generate the required revenue. ... Dyersburg Alderman Bob Kirk immediately asked about the status of Interstate 69. Sanderson responded that he had just met with Tennessee Department of Transportation Commissioner John Schroer, who is concerned about the current funding for the I-69 corridor or lack thereof. Schroer pointed to vehicles extending their gas mileage as well as the costs of asphalt rising. Also Sanderson stated that I-69 began as a federal earmark to construct a highway that runs north and south from Michigan to Texas. Currently there are no federal earmarks to complete the highway. "There is no urgency in his (Schroer's) voice to complete it," said Sanderson. 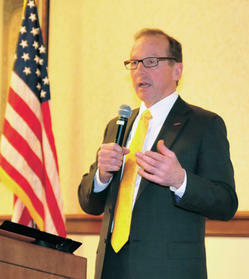 Everyone was encouraged to attend a public meeting with Schroer set to take place at the Chamber on Friday, Feb. 22 at noon. Sanderson said that interested individuals should come and stress the importance of completing at least the portions that are half done in Union City and Memphis. Congressman Fincher stated the Tennessee Department of Transportation is slated to receive approximately $1 billion per year for the next three years. He stressed the importance of spending as much of the money on the I-69 project as possible, because the completion of the interstate highway will lead to the creation of jobs. “It will change forever the landscape of this district,” Fincher said. Fincher mentioned that mayors and other elected official could apply for a grant for “Roads of National Significance” that could possible provide additional funding. He explained there is $1 billion in the fund, and Tennessee could possibly get some of the funding. Fincher stated, over the next three or four years, the lower part of the I-69 project will be completed around Union City, which will cost approximately $100 million. It will cost another $100 million to complete the I-69 project from Memphis to the Mississippi border. I'm guessing that "Memphis to the Mississippi border" means from an I-69/I-269 interchange near Millington to the Mississippi state line. It will now be interesting to see if any I-69 projects show up in a couple of months in the next TIP. It would be nice if Commissioner Schroer will set forth a timeline for completion of the Union City and Memphis segments at the February 22 meeting. Schroer said I-69 projects from both the north and south have begun, with three segments in Union City partially complete. With right-of-way purchases and plans drawn, Schroer said the cost to complete the road to Troy will still take $120 million, half the funds available in the state transportation budget. "We are committed to getting this section done," said Schroer, who estimates it will take four years to complete the second and third segments of the highway through Union City and a little longer to complete the paving. "We will be following that into Troy." Schroer expects that leg of the project to take $60 million. Work on that portion, too, will be divided. "(We will divide that into) two segments," said Schroer. "That will probably take somewhere around a 10-year program." When that section is complete, Schroer said Tennessee will have the north and south sides of I-69 complete. New terrain I-69 from east ... of US 51 near Millington to the Tipton County line is 4.80 miles in length and projected to cost $37,058,429. The LRTP project that includes the I-69/I-269 interchange and the portion of the new highway from US-51 to the interchange is project ID 158: “I-69, East of US-51 near Millington to the Tipton County line. ... This portion of the I-69/I-269 project will connect with the existing SR-385 at US-51 and extend northwest/north to the Tipton County line, with a system interchange (no access to surface streets) where project ID 157: “I-69, SR-300 to SR-385,” ties in. Schroer said Tennessee will have the ... south side ... of I-69 complete. I'm not convinced that Schroer included the SIU 9 TN 300 to TN 385/Future I-269 new terrain "south side" section in his financial calculations. Nevertheless, he appears to be committed to completing the near-Kentucky state line to Troy SIU 7 section in a slow-but-steady fashion; in other words, I-69 in Tennessee is not completely dead. TDOT and Kentucky are working together to define the corridor at the state line. That's key to help justify the I-69 parkway upgrades in Kentucky (helps a bit in Indiana too, but they're going to complete their sections to Indianapolis at this point since SR 37 has the traffic to justify it already). You can still get interstate access to Memphis from Dyersburg via I-155/I-55. I don't see any huge urgency to build SIU 8 in the next 10-15 years without dedicated federal money, given the current pace the various other I-69 projects are on. “We’re in the process of starting construction on the second of three phases (of I-69 around Union City). We should do that within the next year to 18 months and when that’s completed we’ll start on the third section and once those sections are all done, then we’ll pave. They are about two-year projects, so I would say somewhere in the next six to eight years the section around Union City will be completed,” Schroer told The Messenger after Friday’s meeting. “Then you go down to Troy and you’ve got two more projects there. Those are $30 million projects each and they’re probably 36-month projects, so for the completion of the whole area it will be about 10 years,” he said. The route through Obion County (from Fulton, Ky., to the southern border of the county) has been estimated to cost from $230 to $300 million. The article neither mentions projects in the Memphis area nor mentions projects related to the Kentucky state line tie-in. The focus is to finish what has been started on SIU7. It is not our intentions to build a road to nowhere so we are going to focus on finishing SIU 7. This will give us a connection from the Kentucky State line to I-155 at Dyersburg. We estimate that it could take about 10 years to accomplish this. ... It will cost another $100 million to complete the I-69 project from Memphis to the Mississippi border. The I-69 projects in Memphis compete with other projects for dollars and there are more projects in the Memphis area than there are dollars. It will depend on the ranking of I-69 in the list of projects that are important to the area. Since the above November 15, 2012 Memphis MPO ranking does not include any I-69 projects, I suspect Congressman Fincher may have been a little too optimistic in his assessment; however, it may be possible for I-69 to bubble up the priority chain in order to come close to meeting the 2020 goal, particularly with Tennessee scheduled to complete all of its other sections of I-269 by 2015 and Mississippi scheduled to complete its portion of I-269 by 2018. At this time I anticipate the FEIS for SIU 8 will be approved by FHWA this spring followed with the ROD later in the summer of this year.